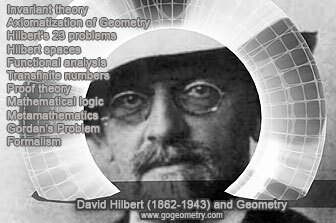 Hilbert's problems, List of twenty-three problems in 1900, Interactive Mind Map, Online MindMap, Elearning. Hilbert's problems form a list of twenty-three problems in mathematics published by German mathematician David Hilbert in 1900. The problems were all unsolved at the time, and several of them were very influential for 20th century mathematics. Hilbert presented ten of the problems (1, 2, 6, 7, 8, 13, 16, 19, 21 and 22) at the Paris conference of the International Congress of Mathematicians, speaking on August 8 in the Sorbonne. The complete list of 23 problems was published later, most notably in English translation in 1902 by Mary Frances Winston Newson in the Bulletin of the American Mathematical Society. Source: Wikipedia, Hilbert's Problems. Mind Map: A mind map is a diagram used to represent words, ideas, tasks or other items linked to and arranged radially around a central key word or idea. It is used to generate, visualize, structure and classify ideas, and as an aid in study, organization, problem solving, and decision. Last updated: Aug 2, 2014.